The manufacturer is currently out of the Aquathol Super K and therefore it is unavailable to us. Please look at substituting Hydrothol Granular for this product. Highly concentrated granular herbicide for controlling submerged weeds. 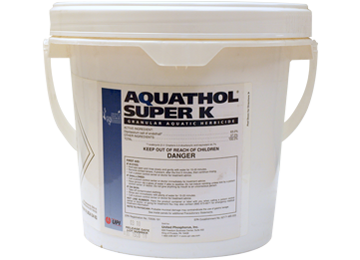 Aquathol® Super K is a highly concentrated, granular aquatic herbicide that controls a wide variety of submerged weed types, most notably milfoil and hydrilla. Aquathol® Super K is also used in Curlyleaf pondweed applications in cooler water temperatures. For a more complete solution, we recommend additional dock and swim area products to effectively control submerged weeds and algae. Improve your recreational area so that you can get the most out of your lake front. Evenly broadcast Aquathol® Super K aquatic herbicide throughout treatment area when weeds are actively growing. For best results, apply during calm weather conditions. *Price includes a $30 HazMat shipping charge on the 20# and 40# bags. Manufactured by United Phosphorus, Inc.
like the guy on 'Forged in fire" says "it will kill"